Home » Daily Bunny » Meet Sunny! This is Sunny in Florida. 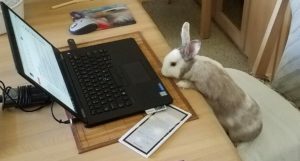 She is very inquisitive and loves sending e-mails from Dad’s computer. She is a one year old Dutch/Dwarf at 3.5 pounds.